Hong Kong is without a doubt one of the most exciting locations for photography. One the one hand you have the intense visuals of China’s world-class city, while on the other hand you have the vibrancy of the lush mountains and tropical bays and coves. That is to say, the urban and natural sceneries do not battle each other, but instead, complement each other. Hong Kong is also a place of varying social landscapes. It is entirely possible to see a flourishing wet market just across the street from a shopping center popular with the most well-to-do professionals in the city. These contrasts in culture and lifestyles can often lead to incredibly profound shots. Here are China Highlights’ best places to take photos in Hong Kong, a metropolis flush with secrets and something new to see around every corner. There are a number of ferries that take you from ports in Victoria Harbor, mostly from the Kowloon side, to nearby outlying islands such as Lantau, Cheung Chau, and more (all great places for absorbing some nature!). If you’re just looking for a quick and convenient water experience for your photography, though, the Star Ferry will be your best option. 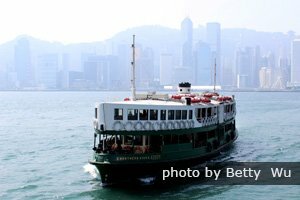 This historic ferry route has operated between Kowloon and Hong Kong Island for more than 120 years and is a mainstay in the city’s transport and tourism scenes. The journey is as affordable as taking a public bus and in just 11 exhilaration minutes, you’ll be on the other side. Nothing compares to seeing Hong Kong from sea level, as you not only see the skylines retreat and approach once again, but also fishermen, commercial vessels, traditional “junk” ships, and perhaps a magical sunset. This is a classic viewpoint that should not be missed. Whether you take the Peak Tram to the top or go the adventurous route and hike the steep 1.7 kilometers starting from Central District, you won’t regret taking the time to reach this stunning peak overlooking all of northern Hong Kong Island. 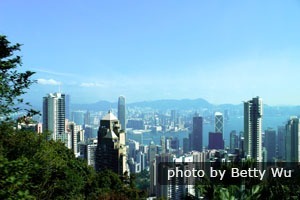 On a clear day, you can even see all the way into the Kowloon and New Territories Districts, across Victoria Harbor and located on the Chinese mainland. 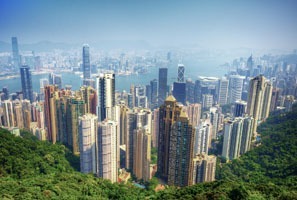 Don’t be shy about spending hours taking panoramic photos at Victoria Peak—or selfies! Ding Dings are the loving nicknames given to the traditional double decker trams that run east-west across Hong Kong Island. Their history stretches back to the early 19th century during the age of British occupation. The best part about taking a ding ding is that it is a different experience every time you ride it. From the first floor, you can take eye-level pictures of daily life just outside the windows. From the second deck, you get to see scenes of Hong Kong as if watching a live TV program. Eastern Hong Kong Island tends to be more traditional and residential, while the western end of the island tends to be more modern. 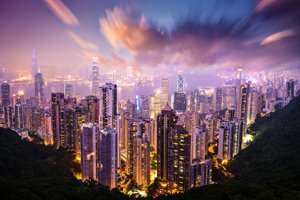 Most likely you&apos;ll have seen before the iconic pictures of Hong Kong&apos;s magnificent skyline, with skyscraper after skyscraper next to each other, colorfully lighting up the skies, and lighting up Victoria Harbor all night long. 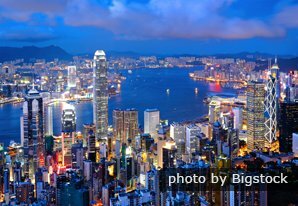 The best place to get your own photograph of this world-ranked view is from the Avenue of Stars on the very southern end of the Tsim Tsa Tsui district in Kowloon District. Whether it’s a sunny, foggy, or rainy day, photos of the skyline will always inspire. 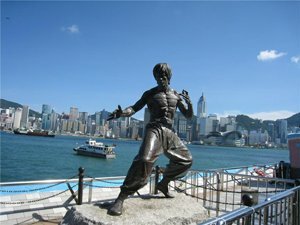 The Avenue of Stars is also where you can take a picture with Bruce Lee! Please note that Avenue of Stars in Tsim Sha Tsui is closed for repair and improvement works, which are expected to be completed around the end of 2018. Often considered as one of the best urban trails on earth and certainly among the best hiking trails in Hong Kong, it’s no wonder that the Dragon’s Back walk is also a great place to take some unforgettable pictures. The trail departs from the eastern end of Hong Kong Island and takes you along the ridges of the mountains overlooking the azure blue sea waters, just like walking across a dragon’s spine, ending at Big Wave Beach. On a clear and sunny day, such as in the months of April to August, it is easy to forget you are in one of the biggest cities on earth, and rather, feel as if you are stuck in a tropical paradise. Found on Lantau Island, the “Big Buddha” of Hong Kong is located on a peak and is the largest, seated, outdoor bronze Buddha statue on earth. The statue itself is as photogenic as the religious environment around it, Po Lin Monastery, and the trail that leads to wooden posts with Buddhist prayers. Looking around you, you will be able to take photos of the sparkling South China Sea and the green ridges of Lantau’s mountains. For an extra-special photographic opportunity, take the 5.7 kilometer Ngong Ping 360 cable car to reach the Tien Tan Buddha Statue and enjoy gliding over this marvelous landscape. Take a break from Hong Kong’s busy urban centers and take a short ferry to Tai O village on Lantau Island. 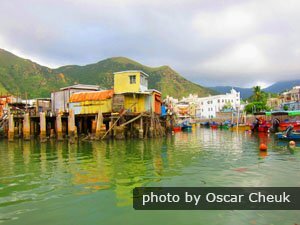 Tai O remains a very traditional fishing town where life is dictated by the sea, and homes are still constructed on stilts in order to survive typhoon seasons and the nightly rising of the waters, making for very picturesque images indeed. This is also a seafood lover’s dream destination, with all kinds of creatures prepared in different ways such as on the grill, on skewers, and in tasty dishes fit for sharing. Stay for sunset to get the most marvelous views of water and mountains existing in perfect harmony. Huh? A museum? That’s right! The Hong Kong Monetary Authority & Museum is curiously located on the 55th story of the IFC shopping mall and financial center on the banks of Hong Kong Island. Admission is free, and guided tours are available weekdays at 2:30pm and Saturdays at 10:30am. Aside from being a great place to learn about the history of Hong Kong’s monetary evolution and see some valuable bills and coins, the museum is a great place for an almost 360-degree view of Hong Kong Island and beyond. Sai Kung is where Hong Kong-ese go to indulge in their favorite adventure sports such as hiking and bicycling in the various country parks. Although you can reach this area by vehicle or public bus, it is also very popular to arrive by renting a private yacht with a large group of friends as part of an all-day rest-and-relaxation retreat. The best parts of Sai Kung are the number of uninhabited beaches and natural trails for nature lovers. Here is where you can take the best photos without crowds of people (sometimes difficult to do in Hong Kong!). There are also various villages which specialize in delicious seafood dishes and make for relaxing breaks from the non-stop nature of Hong Kong proper. 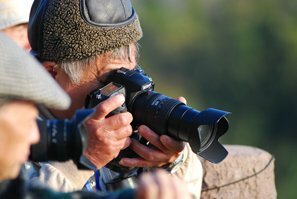 These are favorite aspects of our expert Hong Kong photographers who lead our China photography tours! Don’t be put off by the strange name of this destination. 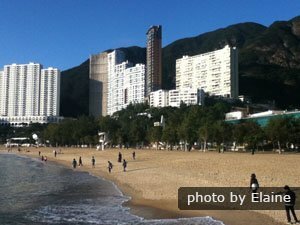 Repulse Bay is a gorgeous beach area on eastern Hong Kong Island popular with all ages, and a collection of old temples are aesthetically pleasing partners to the scenery. Nearby is the district known as Stanley, lined on the waterfront by some of the top real estate on the international market, and a crafts and typical snacks market center winding around the inner streets. After everything is said and done, we have to mention that one of the best places to take pictures in Hong Kong is wherever you already are! The ever-changing scenes and always-on-the-move energy of this cosmopolitan port make for beautiful opportunities for street photography. Peek into a museum, discover the mazes of residential homes, sit back at an old Buddhist temple, ride the subway, stop by a street market (especially Temple Street Market at night), or grab a meal at a luxury restaurant overlooking the cityscape. At the end of the day, it is really quite hard to take a bad picture of Hong Kong! 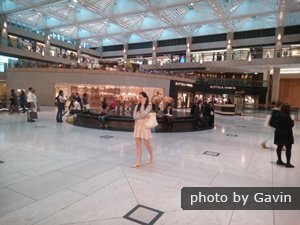 Want to visit all of these sites to create your own incredible Hong Kong photo scrapbook? See our Create Your Trip option to arrange personalized stops with China Highlights! 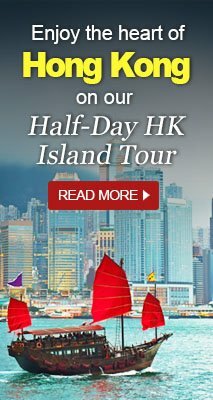 Half-Day Hong Kong Island Tour: You will admire the ultimate view of Hong Kong Island&apos;s renowned skyline and explore a floating fishing village at Aberdeen. 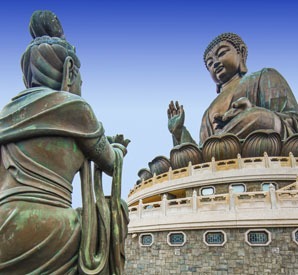 One-Day Lantau Island and Giant Buddha Tour: This tour combines breathtaking natural beauty and fascinating Buddhist culture. Guilin and Zhangjiajie Photography Combo — Get expert guidance over 9 days in these exotic photogenic locations. 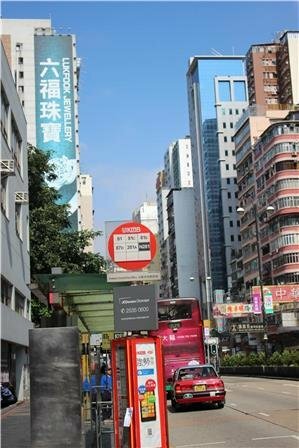 You may choose to enter/leave China via HK for this trip.